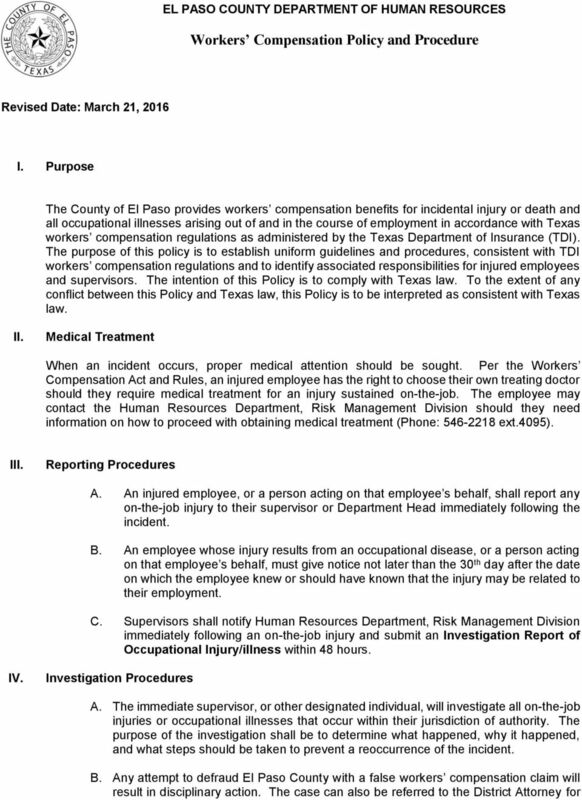 Download "Workers Compensation Policy and Procedure"
3 of this incident is: Why didn't the employee wear goggles? Were goggles available? If so, was the employee instructed to wear them? If so, why didn't the Employee wear them? VI. Handling Emergencies A. Judgment is a key factor in the handling of any emergency. Employees are expected to exercise their best judgment based upon the circumstances. B. The following is a list of guidelines to follow: 1. The employee/supervisor/management personnel shall call the appropriate emergency service (medical, fire, police, or rescue). Call The employee shall notify his/her supervisor. 3. 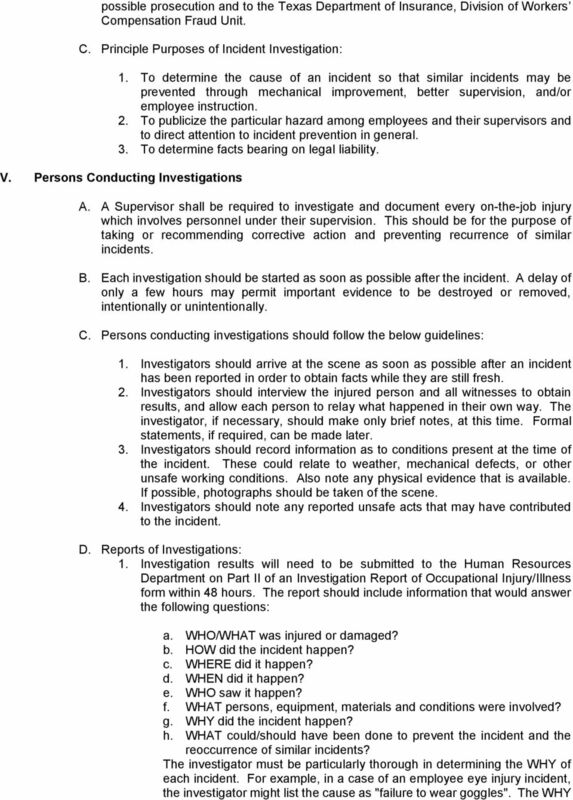 The employee will follow reporting and investigation requirements. *IF THERE IS ANY QUESTION WHATSOEVER ABOUT THE SERIOUSNESS OF AN INJURY, CALL FOR HELP AND TAKE EVERY PRECAUTION TO PRESERVE LIFE. VII. Worker s Compensation Leave and Benefits A. Compensable Injury: 1. 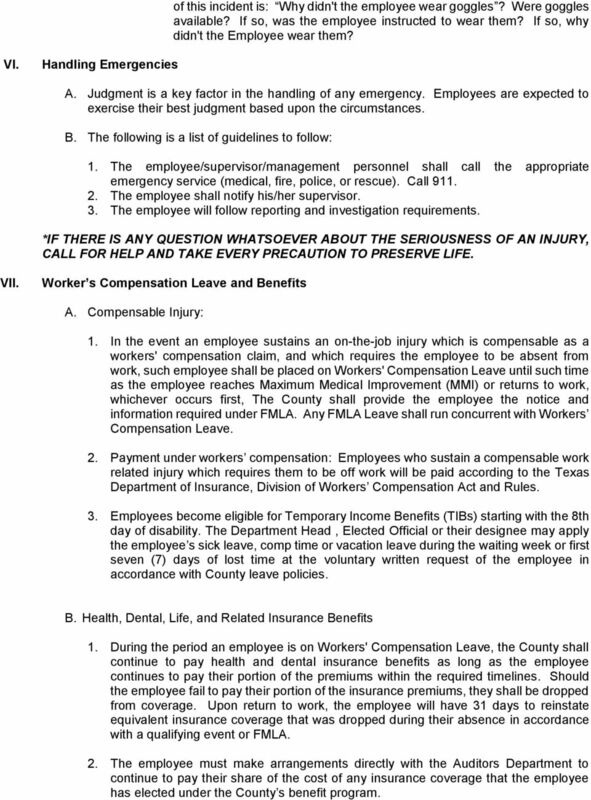 In the event an employee sustains an on-the-job injury which is compensable as a workers' compensation claim, and which requires the employee to be absent from work, such employee shall be placed on Workers' Compensation Leave until such time as the employee reaches Maximum Medical Improvement (MMI) or returns to work, whichever occurs first, The County shall provide the employee the notice and information required under FMLA. Any FMLA Leave shall run concurrent with Workers Compensation Leave. 2. Payment under workers compensation: Employees who sustain a compensable work related injury which requires them to be off work will be paid according to the Texas Department of Insurance, Division of Workers Compensation Act and Rules. 3. Employees become eligible for Temporary Income Benefits (TIBs) starting with the 8th day of disability. The Department Head, Elected Official or their designee may apply the employee s sick leave, comp time or vacation leave during the waiting week or first seven (7) days of lost time at the voluntary written request of the employee in accordance with County leave policies. B. Health, Dental, Life, and Related Insurance Benefits 1. During the period an employee is on Workers' Compensation Leave, the County shall continue to pay health and dental insurance benefits as long as the employee continues to pay their portion of the premiums within the required timelines. Should the employee fail to pay their portion of the insurance premiums, they shall be dropped from coverage. Upon return to work, the employee will have 31 days to reinstate equivalent insurance coverage that was dropped during their absence in accordance with a qualifying event or FMLA. 2. The employee must make arrangements directly with the Auditors Department to continue to pay their share of the cost of any insurance coverage that the employee has elected under the County s benefit program. 6 The Risk Management Division shall facilitate an employee s return to work by consulting with the employee, employee s department, employee s treating doctor and the Third Party Administrator to assure a safe return to work. 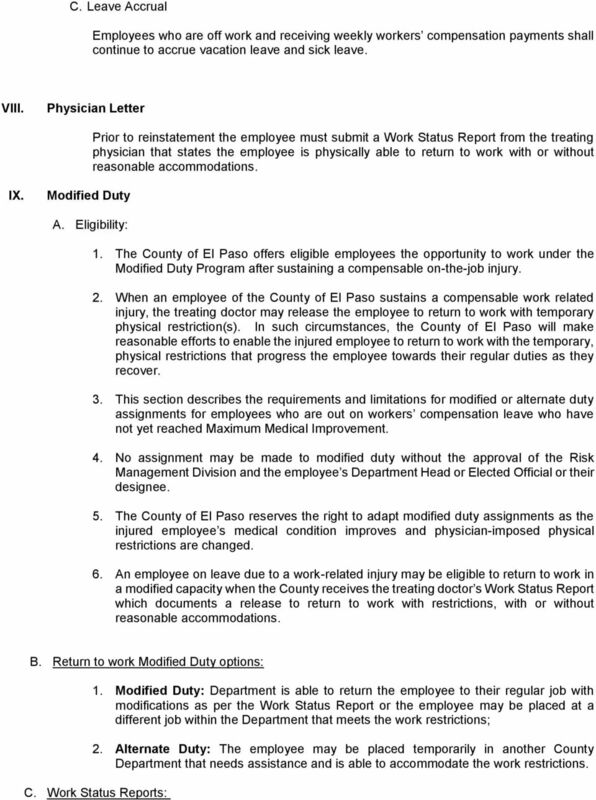 *This policy will not be construed or interpreted to mean any employee has a right to a modified duty assignment or that the County of El Paso is compelled to assign an individual to a modified duty status. Modified duty is granted on a case by case basis, based on the availability and need of the Department as well as the knowledge and skills of the employee, while operating in a modified capacity. 2. 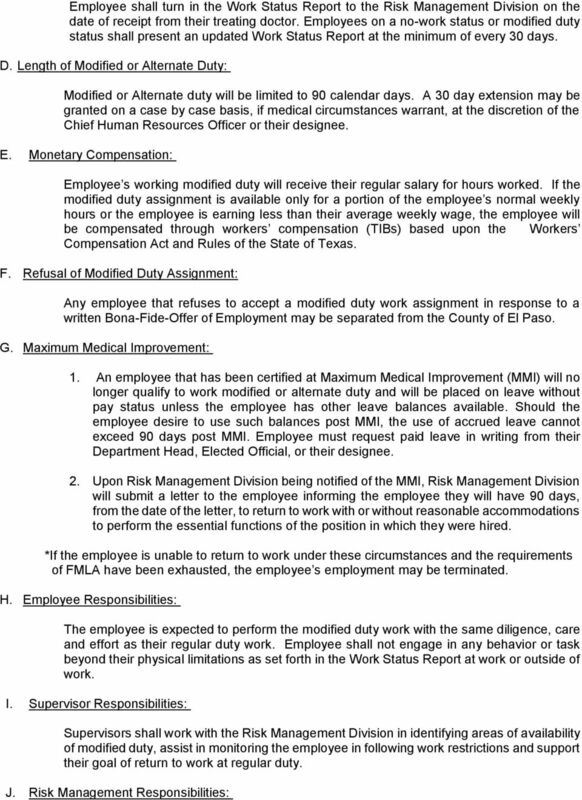 Employees will receive regular pay for the hours scheduled on the day of injury. 1. Employee Benefits: Workers' Compensation provides both medical and indemnity benefit payments for and to eligible employees. Accumulated Paid Leave: Includes FLSA compensatory time, sick leave, deferred holiday time, annual leave and state compensatory time. CITY OF PORTLAND HUMAN RESOURCES ADMINISTRATIVE RULES LEAVES Purpose The purpose of this Administrative Rule is to provide additional benefits to eligible employees with accepted workers compensation claims. The Board of Education contributes to the Oklahoma Teachers' Retirement System, as required by law and its negotiated agreements. 1 of 5 INSURANCE, BENEFITS AND DEDUCTIONS State and Federal Withholdings. State and federal withholding taxes vary according to the amount of income, the number of dependents claimed, and marital status. PROCEDURE Title: Work-Related Injuries/Workers Compensation/Alternate Duty Procedures Related Policy: FDJJ 1004.04 I. DEFINITIONS Accident An unexpected or unusual event or result that happens suddenly. Bowdoin College Salary Continuation Plan for Administrative Staff Benefits under the Short Term Disability Salary Continuation Plan described in the following pages are provided and funded by the Employer. 2. Types of Leave of Absence without Pay. City of St. Louis Human Resource Department City Hall 1200 Market St. St. Louis, MO 63103 (314) 622-4000 SICK LEAVE POLICY I. 2.02.01 Ensure that appropriate care is given or medical treatment is obtained for the injured employee. OPTIONS DEFINITION NOTICE REPORT TO CARRIER FIRST REPORT OF INJURY The District shall extend workers' compensation benefits to its employees by choosing one of the following options: 1. Becoming a self-insurer. Benefits under the Short Term Disability Salary Continuation Plan described in the following pages are provided and funded by the Employer. 03.602 Compensatory Leave and Overtime. b. Supervisor: An employee s immediate supervisor, section supervisor, foreman, or general supervisor.